So you think you had a hard week, eh? What prompted this story was when a New 49’er member along the Rogue River last season flagged me down and handed me a copy of Skin Diver Magazine which was dated June of 1974. “You are in there!” he told me. I remembered the magazine article as soon as he handed me the magazine. I thanked him for the magazine, took it home and read it. Boy does that bring back some long-ago memories! 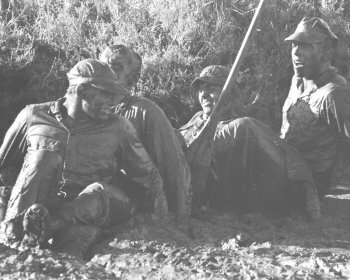 The story was a reporter’s account of the “hell week” that I endured with 7 other young men during my fifth week of navy SEAL training (BUD/S), Class 76 in Coronado, California in early 1974. Way back when the article was first published, I was pretty disappointed that the reporter did not do a very good job in describing how difficult the challenges were for us during that week. There were numerous events that we suffered through which the writer did not even talk about. Reading the article now, considering that he missed a lot of the events (because he was returning to a nice, comfortable hotel each evening to get a full night’s sleep), he did about as good as anyone could do who did not actually go through hell week as an active participant. Those of us that made it through, for the most part, seldom talk about it to others who have not gone through it. 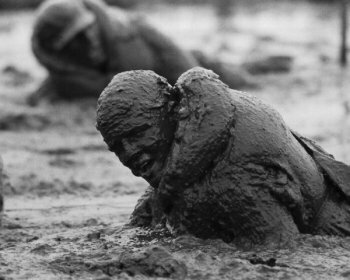 “Hell Week” in navy SEAL training is one of those things you can only fully appreciate if you do it. Reading the article in Skin Diver prompted me to post it on our Internet Forum and challenge our members up there to guess how many of the pictures I am in. There was quite a bit of discussion and some guessing over this. In going back to look closer at the images to see who won my challenge, I came to the conclusion that each image was only a momentary snap shot of just one of many wild and dangerous adventures which took place during that week, not really doing the events much justice. I’m not sure why it is; but as you start getting older, the major events that changed your life-direction forever become more important to you, and sometimes you want to share some of the interesting parts with those of your friends who are interested. I am in the sharing mood at the moment. So if you are interested, I will refer back to the original story that was published in Skin Diver Magazine in June of 1974(My comments below will be in better perspective if you read the original story first), and I will add in some of the meaty stuff which the reporter missed altogether because he was having a nice dinner at the Hotel Coronado while several young guys were being given the test of a lifetime; something most people fortunately will never have to experience. Some of this will be a repeat of what I posted on our Internet Forum. Most of it will be new. Since the writer begins with the subject of drownproofing, we might as well take that up first. I will never forget this terrified guy in the first group of trainees that was shoved into the pool during drownproofing (legs tied together hands tied behind his back) in just the first few days of hell week. It might have been on the first day. He panicked. Just the few times he managed to get his head above the water, he yelled “I quit!” The problem was that the only safe way to quit was to ring a special bell that was miles and miles away from the pool. As this was just the first group in the pool (deep end), as an important object lesson to the rest of us, in a ritual that I’m sure they had performed many times during the past, all of the instructors lined up alongside the edge of the pool, lowered their heads as if at a funeral, and watched the guy drown. Eventually, after the poor guy (“quitter”) passed out and sank to the bottom of the pool, one of the instructors jumped in and pulled him out. Paramedics on the scene revived him and took him away in an ambulance. I was in the front of the next line of trainees, so I got to watch it all play out directly. This gave the term, “sink or swim” a whole new meaning! It was a very sobering experience. There would be many more. There was zero sympathy for quitters in this program! Once we reached the pool during the first drownproofing event during hell week, nobody was given an opportunity to quit before getting shoved into the water. If you were going to quit, it was going to be in the deep end of the pool with your hands and feet tied! This was a very serious business. Here is the object lesson, which has stuck with me my entire life: There really is no quitting; because if you give up, life will just run you over and over again until you finally stand up to it. There is an image in the article of Master Chief Estok. Chief Estok was the meanest man I have ever met. In retrospect, he was on a personal mission to make certain that no trainee was allowed into the SEAL Teams that was not supposed to be there. You didn’t go to Chief Estok and tell him about your problems. That would be an invitation to the beginning of your departure from the training program. Back to Skin Diver, I do not see myself in the image of the 50-foot cargo net. To me, this was the most difficult obstacle in the obstacle course, because it was about ¾ of the way through the course. By then, at least for me, my whole body was jelly and my lungs burned like they were on fire. As the article says, at least at that time, the course record was 6 minutes. My best time was 6:20 minutes, several minutes faster than the average time. That’s because I was going out there to practice during Sunday off-time. I worked out numerous gymnastic moves to get through the obstacles faster. But the one thing I could never master was descending the cargo net hand-by-hand without using my feet. My arms were not strong enough to take a chance at missing a grip and falling. So I was climbing down the back side of the net just like everyone else, which took a lot of time. I watched the course record holder, an officer by the name of Bob Baird, do the course one day. He was able to drop at least 30 seconds off his time by putting his feet out behind him, and using a hand-to-hand method of controlling a free fall from the top of the net. The guy was an animal! One unfortunate guy fell off the top of the 50-foot cargo net in the obstacle course about mid-way through hell week. He got hurt pretty bad. They took him away in the ambulance that was always standing by. We never saw him again, either. There was not very much sympathy for students that allowed themselves to become too injured to continue. You either made it or you didn’t. Guys taken away with serious injuries seldom ever returned to BUD/S training. Of special interest to any SEALs reading this, there was a young lieutenant JG in this class who had recently graduated from Annapolis Naval Academy. I will never forget how difficult it was for him on the first day we had to traverse the obstacle course (longest and most difficult in the world at the time). I just knew him as Mister Olson. 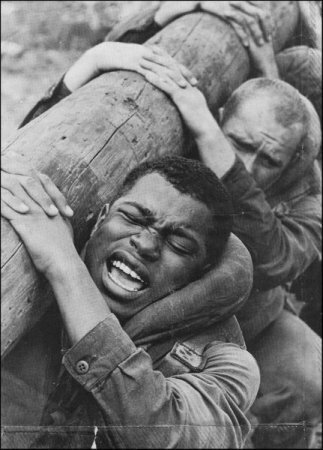 This was just in the first day or two of of phase-one training in Class 76, long before hell week. There were a lot of guys who were not up to the obstacle course. Guys were quitting left and right, mostly prompted by aggressive instructors because they could not keep up, or because they had that “quitting look” in their eye. The obstacle course came pretty easy to me because of my gymnastics background in high school. But others were having big problems with it on the first day. Mister Olson was one of them. I’ll never forget him hanging off the “Slide for Life,” about half way through the course. The “Slide for Life” was this long, long slightly descending rope that was strung between two poles. You had to up climb a 30-foot pole. Then, using your feet and hands, you had to shimmy your way all the way down to the other pole. It was a long way. 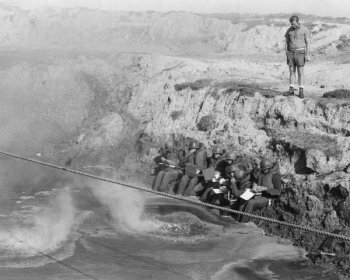 When Mister Olson dropped from the rope (a long way) to the sand about half way through the obstacle, the instructors went into a frenzy trying to get him to quit. Instead, he got up and climbed the pole again and gave it another try. Then he fell off again; got up; and started to climb the pole. 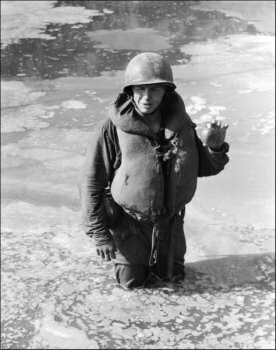 Rather than kill him off, the instructors told him to move on to the next obstacle. Mister Olson was also spending Sunday afternoons practicing out on the obstacle course, and he mastered it in time for us to begin meeting the required times. Two-man team in a relay race where we had to make summersaults over each other to roll our way through the mud. That was probably the fifth day into the grueling week. We were some pretty tired young men out there! Back to Skin Diver, that image of the guy with the muddy face is not me. But it could have been any of us. 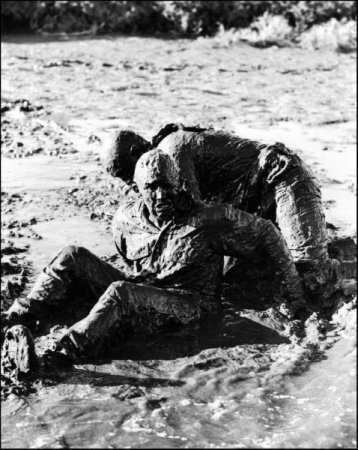 We spent the better part of a full day later in the week doing relay races and different kinds of military reconnaissance exercises in the mud and in cold, shallow water. One of the most common things the instructors impressed upon us in training is that “it pays to be a winner.” So, all throughout hell week, we were competing against each other for points in teams, and also as individuals. Those two guys who had accumulated the most points during the week were going to be freed from the final event of hell week – which was an all-night treasure hunt covering dozens of miles in search of “the next clue,” ultimately that would lead to the final destination the following morning, which was the end of hell week. So, points were important. We were working together, but we were also competing for points. The mud flats were no exception. That is me on the left side of the log in the Skin Diver image. Note that I was the tallest guy in the class. Rod Long is the guy next to me. He was the shortest guy in the class. Can you see how he has to reach up to make contact with the log? This was because the instructors liked me. “No pain, no gain!” You had to take this kind of harassment with the right attitude, because they were testing you every minute of the day. There was no place for ego or a disappointment-attitude. There were no rights. There was no safety net. While we worked together, each one of us was completely on our own in the way we positioned personal identity in the training. Rod Long went through the whole week with a broken foot. He told me that it was the constant pain that got him through the week. That’s me on the left in the hell week graduation photo (Skin Diver). There are only seven of us in the image, but eight of us survived the week. Seems like the eighth guy was being treated for some serious shin condition that happens when your feet are wet for long periods of time. Do we look tired or what? That’s also me in the article kind of standing up in front of the raft during night rock portage. I will include another image below which shows it better. I was in the “bow man” position. Besides having to reach out in front of the raft with long, hard strokes to overcome heavy surf when launching the boat, my job during rock portage was to jump out of the boat onto the rocks with the raft’s bow line and keep the retracting waves from pulling the boat away. This way, the others could get out of the boat and onto the rocks, too – rather than end up getting washed into the water and smashed onto the rocks by the waves. Doing my part required split-second timing. I had to jump out of the boat just as it made contact with the rocks. It was not easy; because in the dark, I could not see what I was jumping onto. The image was snapped just as I was jumping out of the boat. Note that it was pitch dark out there, except for all the lights from parked vehicles on the beach that were shining in our faces, blinding our view. I will never forget this night. The surf was strong; maybe 5 or 6-foot surging monsters that were breaking just before the rocks. Paddling out through the waves was nearly impossible, because the instructors deliberately waited until a big set was upon us before giving the order to launch. As hard as we paddled, every wave would push us back to where we were in danger of being smashed backwards onto the rocks. It was a sheer force of wills, us against unrelenting mother nature, requiring our combined total physical commitment to break through the waves. Once we got out beyond the surf zone, we had a moment to reflect upon the much more difficult and dangerous task ahead. We had to paddle back onto the rocks through that surf zone — in the dark! Because it was dark out there, we were not able to see the size or location of the waves when we were paddling in towards the rocks. So we just had to accept whatever came along as we entered the surf zone. Anyone that has ever done any surfing, boogie boarding or body surfing knows the feeling of catching a wave. With these rubber rafts, in the dark, you had to paddle as hard as you could and just hope that the wave would pick you up, rather than crash down on top of you and swamp the boat. If the boat got swamped in the surf, you were a goner! I will never forget the realization of riding on my destiny as we paddled into the surf zone on our first pass. But we were fortunate to be in just the right place at the right time; and this huge wave picked us up and swept us completely through the jagged rocks, totally ripping the bottom of the boat out in the process. We ended up on dry ground when I jumped out to do my bow man duty. There was a huge crowd of bystanders on the beach. They roared in applause, and the instructors went wild; I had never seen them more jacked up and pleased. “Now that’s the way you do it,” one instructor was congratulating us, over and over, again. We were rewarded by being ordered to knock out a few sets of pushups (30 per set). I was counting my blessings for being so lucky, because only part of that had to do with our performance. We were just in the right place at the right time. The second boat was not so lucky. Another big wave caught them; but the coxswain was not able to keep the raft from broaching (turning sideways), and all the men got dumped upside-down by the wave directly onto the rocks. Several were then carried out into the water by the receding waves. Then the next wave crashed them right back on top of the rocks again. This happened several times until the instructors finally got them out of the water. Several guys got taken away in the ambulance. They were mangled! We never saw them again. Peterson lost all the skin off the palm of one hand. That had to hurt bad. But he never said a word about it. Landing rafts on the rocks during a storm, in the middle of the night, is not for sissies. As soon as the ambulance departed and the crowd was pushed back, the instructors ripped into the remaining guys from the second boat crew for their failure and then made them paddle back out to do it all over again; only this time, they were made to use the boat that we had torn the bottom out of. If you ever tried to paddle a bottomless rubber boat out through heavy surf, you know they did not make it very far. The whole second crew ended up awash back onto the rocks. By this time, I think the instructors were feeling heat from the hundreds of onlookers who were watching the entire thing play out. The whole event was beyond brutal. That is me on the right, jumping off the front of the boat just as it was colliding with the jagged rocks. To recover, they ordered our first boat crew to take the remaining good boat back out and show everyone how to do it the right way, again. Mister Olson was a heck of a good coxswain. 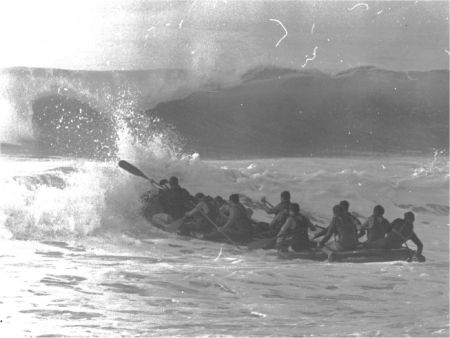 Those bulky IBS rubber boats were difficult to keep from broaching when riding a big wave. I cannot tell you the number of times we broached and capsized during training. It was pretty common to broach in big, surging waves. Notice in the images that there are only three of us in the boat? This was probably on the 3rd or 4th night of hell week. We were exhausted. But we did not want to get smashed on those jagged rocks like the other guys did. So we paddled like our lives were in the balance (they were). While our second landing was not as dramatic as the first, we did manage to catch another wave and tear the bottom out of the second raft, as well. There was another whole round of congratulations – meaning that we had to knock out a bunch of push-ups and sing some frogman songs for the onlookers. The three of us won a lot of points for that. 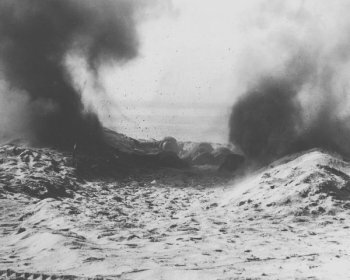 The main thing I remember about going through the demolition fields was that I could not manage the noise of the blasts. The instructors told us in no uncertain terms that we were not allowed to cover our ears with our hands. Doing so would be akin to quitting. They said covering our ears would cause pressure-differentials that could burst an ear drum. But I personally believe it is because they do not want a bunch of SEALs out in combat holding their hands to their heads to lessen the shock of intense combat. It’s better if the SEALs are toughing it out and shooting back! To lessen my own ear pain, I followed directly behind Rod Long. Every time they told us to drop (prepare for more explosions), I ripped Rod’s legs apart and stuck my head between them. By this time in the week, our whole bodies were chaffed raw from never-ending wet, cold and the sand. I knew my helmet was just killing Rod (between his legs). He kept yelling back at me to stop. But every time they told us to drop, my head was between Rods poor legs, every time. Not that it did me any good. My ears are still ringing from that day, and I’m sure they will ring for the rest of my life. The opening image of the Skin Diver article is me on the ropes. We knew nobody had ever made it all the way across. Chief Estok was using a jeep to loosen and tighten the hand rope, flinging some of us as much as twenty feet into the air. There were points for whoever flew up the highest, and more points for whoever made it closest to the far side, so we all gave it our best. This was mainly for entertainment of the instructors. They were having a blast! We were just doing our best. Eating lunch: That is Scotty Lyon standing above us. If you look close, you can see that he has a cigar in his left hand. He used to smoke a cigar while leading the first phase soft sand runs! And those were some hard runs, too! After the ropes, the instructors allowed us about 15 minutes to eat a box lunch down on the edge of the putrid demolition pit. For our eating pleasure, they tossed some smoke grenades into the water just in front of us. Nice! Then they had each of us stand up in the stink-water and give a small talk on some subject; any subject. It was pretty hard for me to think of any story that late in the week, and I can only remember that mine was pretty lousy (no points). But Mister Olson stood up and provided a wonderful, detailed story about the life of the apple that he had been saving from his box lunch. Who would think that anyone could be so creative after being put through so much misery? Mister Olson won big points for that story! Mister Olson giving his story. The most difficult and traumatic event of the week was not even mentioned in the Skin Diver article. My guess is that the reporter was not invited to this one. It happened just after we had finished several hours of non-stop relay races in the pool on base. From there, it was only a short run (we ran everywhere with rafts on our heads) over to an indoor basketball court (competitive hardwood floor). This is where we went into a one-on-one basket ball tournament. We stripped down to just our bare feet and bathing suits. The game was simple. Whoever sunk the first five baskets anywhere on the full court was the winner. The only rules were no biting, no hitting in the face, and no kicking in the balls. Anything else was allowed. One game was played at a time. The rest of us watched. This event was managed by Scotty Lyon. While we did not know it until later, there was an object lesson he wanted to teach us that had nothing to do with basketball. Scotty Lyon was the ultimate navy SEAL. He had a long history of running covert operations in many of the hot spots where the U.S. had an active interest (some places where the interest was “unofficial.”) Scotty was the officer in charge of first phase BUD/S training during the time when I went through. He was the person who set the standard that you had to meet if you expected to make it into second phase. The standard was nothing short of actually becoming a navy SEAL, even though you had not finished the training, yet. 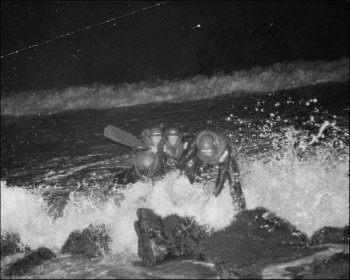 To make it, you had to demonstrate that you were just as tough and committed to the SEAL standard as the instructors; that you would never quit; that you would always be on time; that you would always be as prepared as possible; that you were always ready to cope when things went wrong (as they usually do), that there were no excuses for failure; and that when the situation demanded it, you were willing to do anything to come out on top. Scotty was the first adult-figure in my life that acknowledged to me (without saying it) that I could make something meaningful out of myself. Training under him changed my life forever. I was lucky. This particular event happened sometime around mid-week, so we were some pretty exhausted guys. I had played some one-on-one basket ball in high school with my friends, but I was never good enough in basketball for competitive sports. Most of the other guys were not very good at basket ball, either. That is, except for Peterson, who was a first string player on his all-state high school basket ball team. Peterson could sink nearly every basket from the outside! With single elimination, it did not take that long for it to get down to just Peterson and me in the final play-off. Looking back on it, I figure Scotty Lyon had it all out planned this way from the beginning. It was going to be the best out of three games. Peterson made short work out of me (5-to-0) on the first game. Then Scotty stopped everything and re-explained the rules to everyone present. The doors to the basketball court were closed and it was just me and seven other students and just a few instructors. Scotty then made it abundantly clear that the event was not about basket ball; it was about winning against all odds. When I tried to tell him that I did not want to hurt Peterson, my objection was forcefully overruled and he said that I was to win on whatever terms were necessary, as long as I did not bite, kick Peterson in the balls, or smash him in the face. This was not a request. It was, perhaps, one of the main object lessons of the entire week. There was no way I could compete with Peterson in basketball with any chance of winning. We both knew that. Peterson’s mistake was jumping up for the ball when Scotty Lyon tossed it up and blew his whistle (the typical way a basket ball game is started). Peterson got the ball, and I brought him down into a full body slam on the hardwood floor, as hard as I could. It had to hurt, because it took him so long to get up, I had my five baskets sunk before Peterson was back in the game. The score was one-to-one, and everyone knew that the whole game had changed. This was the ultimate training in unconventional warfare. This was about coming out on top no matter the cost. Scotty Lyon had set us free and ordered us to make war on a basketball court. Sometime during the second game, the small toe on my right foot got dislocated and was sticking out kind of sideways in a strange-looking direction. All of us had long-since passed the pain threshold to where pain just did not matter anymore (but physical exhaustion mattered a lot). Scotty had one of the instructors tape it to the second toe so we could get on with the final play-off. Scotty ordered the other 6 trainees to perform doing cheer leading for the final game. Mister Olson was leading the cheers. While I was challenged with my own situation, I was amazed that Mister Olson could come up with cheer leading chants on the spot under those circumstances. He created them out of the frogman tunes we sung on our long runs. It was all so surreal! On the initial toss in the final game, Peterson did not make the mistake of jumping for the ball, again. He faced off with me (smart). So the ball knocked off of one of us and bounced off towards the side of the court. Since there was nothing present for us to fight over, Peterson decided to chase the ball. After all, he could sink baskets from wherever he got the ball in his hands. As Peterson was a formidable opponent in any game, I was thankful that he was still playing basket ball. He never reached the ball. With the last of my physical reserves, I chased him down, caught him at a full run, and put him into a full-on body slam to the floor as hard as I could, once again. He didn’t get up. I was so winded; it took me about ten tries to sink 5 baskets. Maybe 15 tries. I won major points, but they were not celebrated by anyone. Even the other instructors were shocked at the brutality that I had unleashed upon one of my fellow students. It was grossly unfair to Peterson. Afterwards, Scotty gave us a short lecture that there is nothing fair in unconventional warfare. You win. End of story. Peterson was hurt, but he still made it through the week, and through the training. We served in a platoon together after we were in the Teams. But there was always some distance between us after that day. Can you blame him? He was on the receiving end of unconventional war from me, unleashed by Scotty Lyon. I was lucky that Peterson wanted to win by sinking baskets. Had he switched gears, as I had, and faced off with me in all-out war, maybe neither of us would have survived hell week on that basket ball court. That would have been true with any of the other guys remaining in our class. I’m pretty sure this is Peterson. For me, this was one of those things you do in your life that you can never forgive yourself for. Peterson was my friend. But we were pawns in a bigger game that we both had signed onto. Scotty Lyon told me clearly that he expected me to win at any cost, so that’s what I did. If I did not incapacitate Peterson, chances are likely that he would have won the game. I was working on almost zero physical reserves. Putting him down hard was the only way I was sure to follow Scotty’s order. All things considered, if I had a chance to go back and do it all over again, I would not change anything. Sometimes life forces you to make very difficult, painful decisions. Navy SEAL training taught us to think unconventionally – kind of in an “anything goes” sort of way. Mainly, we were taught to always arrive on time, get the job done, and get home again. We were taught in SEAR school (POW survival school with water boarding) to never get caught. Once in the Teams, when we ran operations against other SEAL platoons, you never wanted to get caught – because they would torture you (just for getting caught)! I’m serious about this; SEALs hold each other to a very high standard. That’s me on the right, then Mr. Olson, then John Masters, then Peterson. We would have been racing hard against the other four remaining guys. As part of our unconventional thinking ahead, Peterson and I drove my motorcycle into San Diego a few days before hell week and rented a full bottle of helium. We used that (when the instructors were not looking) to fill our rubber rafts during hell week to make them lighter. We did not have any cars at the time. So I drove my motorcycle with Peterson holding a full bottle of helium on the back. To us, it was just another exercise (we could have swam the helium across the San Diego bay if we needed to), but it sure got us some surprised looks when we took the highway bridge over to Coronado. Peterson and I also used my motorcycle to drive miles and miles down the silver strand and bury stashes of chocolate and brandy, so our boat crews could secure a little bit of sugar and warmth during the multiple very long paddles and marches (with helium-filled rafts) down that way during the week. Looking back, it was probably more about getting away with something forbidden by our masters, than a nice shot of warm brandy when we were beyond freezing. Maintaining some indomitable spirit under the circumstances was part of the unconventional thinking the training placed upon us: Anything goes, but don’t get caught! Mister Olsen and I had accumulated the most points at the end of the week, so we both were freed from the last grueling event. All of the others made it through. They reported that it was pure hell. I’m sure it was! 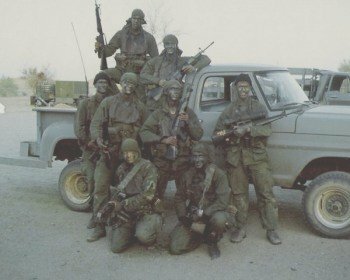 Second phase class: These were the guys I went through second and third phase with. The image was taken while we were doing heavy weapons training out at Niland, California. I’m the handsome young man standing in the truck. I pulled a groin muscle during a run a few days after hell week on a soft sand run that was being led by Scotty Lyon. Even though it meant getting cigar smoke in my face, I always positioned myself in Scotty’s footprints in the sand. This injury probably would have been alright; except that in BUD/S training, you do not have the option to stop everything and try to explain that you are injured. So I kept running until it was so bad that I was pretty-much hobbling along on a single leg. That’s when Chief Estok asked what the hell was wrong with me in his normal very derogatory manner. I told him “nothing.” Scotty heard the exchange and stopped the run. Then he told me to ride along in the ambulance. I figured that was the end for me. 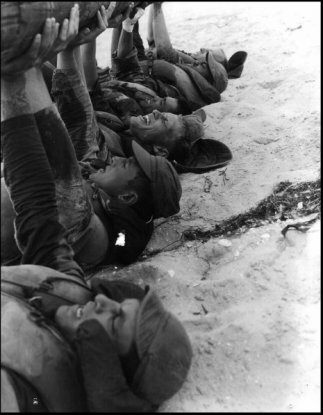 But since I had survived hell week, the training unit kept me hobbling around on crutches while I healed. Rod Long was also rolled back to following class with his broken foot. So we eventually graduated with a different bunch of guys that made it through a different hell week. About half the guys from my original class, including Mister Olson, were transferred to other places, and I never heard from them or saw them, again. 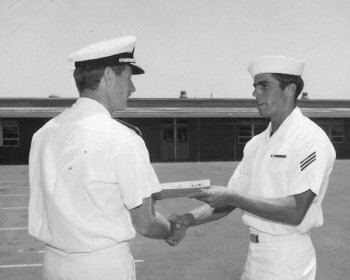 Graduation ceremony from BUD/S class 77. 3. Rod Long, John Masters and I ended up in a platoon together (with Peterson) and covered a lot of ground together in the Philippines, Hong Kong, Singapore, and in other exotic places. We were present during the American extractions from Viet Nam and Cambodia. Have you seen those old history clips of the military helicopters unloading people onto American ships and then being shoved off into the sea? We were there. I have kept in touch with Rod Long over the years, and several other SEALs that I served with. But we pretty much have all gone our own ways. Mister Olson went on to become a highly-decorated admiral in the U.S. Navy; and last time I checked, continues to serve as one of the most respected leaders in the history of the SEAL Teams and Special Warfare Group. I encourage you to read about him here. Even as a young lieutenant JG so many years ago, he was one of the best men I have ever met in this life. There have been a few others. But I will save them all for another story. I’ll bet BUD/s training these days is just as challenging, or perhaps even more so, as it was when I went through. 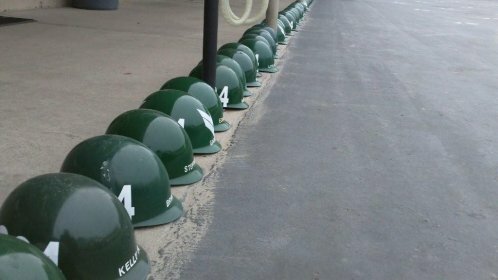 Here is an image sent to me by my old SEAL buddy, Don Stevens, showing a line of helmets (each from someone who dropped out) of a recent BUD/s class. We should all appreciate the young men who are actively fighting for our freedom. They don’t do it for money. They do it for honor, for adventure, for each other; and because the structure provides an opportunity for young men to achieve personal greatness and direction in their lives. Most of all, they do it for God and country. Note: This story was just about a single, special week that was part of a 6-month training program (now longer, I believe). While there was only one “hell week,” every week was hell. We had to exercise our skills against the instructors during the second phase of training — where the emphasis changed from “quitting” to performing. Making it through hell week was just a step. The standard is so high in this training, I doubt if any student ever took it for granted that he would graduate into the Teams until the SEAL Trident was actually pinned on his uniform! Jumping Ship in Hong Kong!